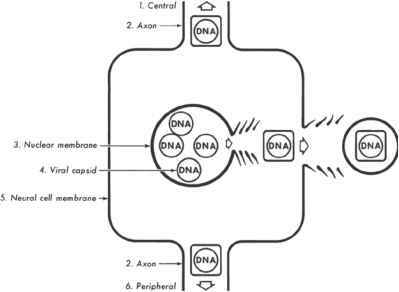 FIGURE 3 Schematic representation of HSV replication within sensory ganglion cells shows centripetal and centrifugal migration and envelopment with portions of neural cell lipoproteins. Abbreviation: HSV, herpes simplex virus. Source: From Ref. 8.
are associated with lymphadenopathy. Systemic symptoms include fever, malaise, myalgia, anorexia, and dysphagia. 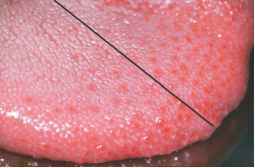 Painful, shallow ulcers are formed by breakdown of individual vesicles. Skin vesicles persist longer and develop into crusted ulcers that heal in five to seven days (6). occur; unlike primary infection, however, constitutional symptoms are minimal. Recurrent episodes last three to seven days and can be frequent or occur once or twice in a lifetime. Over time, the number of annually recurrent episodes tends to decrease. The neurologic manifestation of recurrent infection depends on the neural ganglia specifically involved in the reactivation: Whereas the sensory component of the peripheral neurologic system is separated from the motor system, motor fibers in the cranial nerves traverse the ganglion in direct contact with sensory ganglion cells. This intimate contact is postulated to lead to virally induced demyelinization of motor fibers and subsequent paralysis or palsy (8). Every sensory system has an inhibitory system, and in the cranial nerves, the inhibitory fibers traverse the ganglion. Decreased function of the ganglion cells cause hypofunction, whereas loss of inhibition creates a hyperactive state such as intolerance to light, sound, and touch. Photophobia results from reduction in the number of inhibitory impulses reaching the optic nerve; phonophobia results from reduction in the number of such impulses reaching the auditory nerve. To emphasize the similarity of symptoms associated with loss of inhibition at different nerve sites, this discussion will refer to phonophobia in place of hyperacusis and will refer to somatophobia in place of hyperesthesia (8). Reactivation can occur in one ganglion or in multiple ganglia. When occurring in multiple ganglia, reactivation represents polyganglionitis. Table 1 lists the signs and symptoms associated with cranial and cervical ganglia function, decreased function, and loss of inhibition, as well as the clinical syndromes that these processes are postulated to cause (Fig. 5). The most visible clinical manifestation of herpetic polyganglionitis is Bell's palsy, a condition which commonly affects the trigeminal, glossopharyngeal, vagal, vestibular-cochlear, and cervical nerves (9). Otherwise-healthy patients affected with this condition present with a one-sided facial droop (Fig. 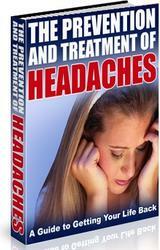 6) and complain of pain behind the ear as well as facial numbness on the affected side. Other symptoms may include dysgeusia and phonophobia (hyperacusis) resulting from loss of inhibitory impulses to the cochlea, probably originating from the olivocochlear bundle of cranial nerve VIII. Results of physical examination confirm numbness of the face (trigeminal nerve) and postauricular area (second and third cervical nerves) (Fig. 7). All patients with Bell's palsy have unilateral inflammation of the fungiform papillae of the tongue (Fig. 8). Some patients with Bell's palsy have unilateral inflammation of the circumvallate papillae (Fig. 9), which are supplied by the glossopharyngeal nerve (8). Other patients may have partial motor paresis of the palate (Fig. 10), which is supplied by vagus nerve. The features of migraine headache are not clearly differentiated from those of severe tension headache caused by muscle contraction. Both types of headache are usually unilateral, have a female-to-male predominance of 3:1, are activated by stress and menstruation, and are associated with varying neurologic signs and symptoms. The unilateral nature of the headache is not fully explained by describing the pathophysiology causing both types of headache. FIGURE 5 Diagram describes signs, symptoms, and proposed diagnosis of herpes simplex-1 polyganglionitis. 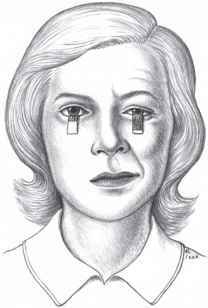 FIGURE 6 Illustration shows a woman with right-sided facial droop as well as decreased lacrimation indicated by Shirmer tear test. Source: From Ref. 10. 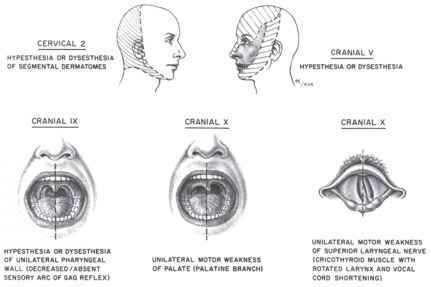 FIGURE 7 Illustration of cranial and cervical nerves often affected in Bell's palsy and in HZV facial paralysis. Source: From Ref. 10. FIGURE 8 Photograph of tongue of patient with left-sided Bell's palsy shows unilateral inflammation of fungiform papillae on the left with minor extension across the midline. This condition occurs in 100% of patients with Bell's palsy. FIGURE 9 Photograph (mirror view) shows unilateral inflammation of circumvallate papillae in a patient with left-sided Bell's palsy and dysgeu-sia. (A) Inflamed circumvallate papillae on the left side. 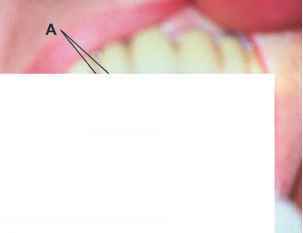 (B) Normal circumvallate papillae on the right side. Source: From Ref. 9. FIGURE 10 Photograph of a patient with right-sided Bell's palsy shows how unilateral palatal weakness becomes more apparent when the tongue is used to stretch palatal folds. Source: From Ref. 11.
headache (cervical nerves 2 and 3), stuffy sensation in the ears (cranial nerve X), tinnitus with hearing loss (cranial nerve VIII, the auditory nerve), earache (cranial nerve V), dizziness with nystagmus (cranial nerve VIII, the vestibular nerve), burning throat (cranial nerve IX), and masseter muscle weakness (cranial nerve V). Clinical manifestations related to the auditory-vestibular system (cranial nerve VIII) can be traced to either branch of the nerve. Vestibular neuritis or neuronitis describes the vertigo associated with viral reactivation within the vestibular ganglion alone. Acute sudden hearing loss or cochlear Meniere's disease describes the hearing loss, tinnitus, and phonophobia associated with viral replication in the cochlear division. Involvement of both nerves suggests a clinical diagnosis of classical Meniere's disease. Many patients with this diagnosis complain of pharyngeal pain (cranial nerve IX) and facial hypesthesia (cranial nerve V), symptoms which further document involvement of multiple nerves (13).